Every winter I’m going through a beet phase. I’m a mean, lean, beet-cooking machine. 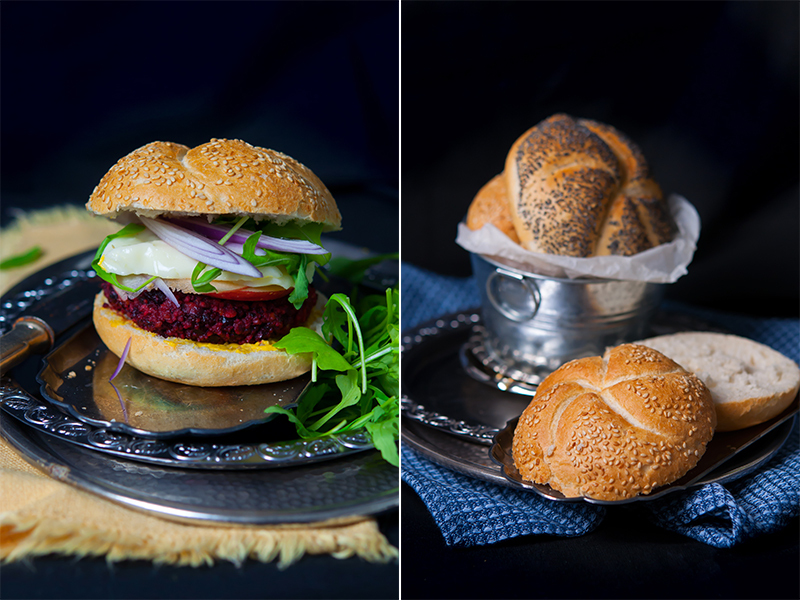 I buy lots of it and then I get creative: salad, soups, dips, spreads and now… burgers. Why? Because beets, as you probably know already, are incredible veggies, packed with potassium, magnesium, iron, vitamins A, B6, C and folic acid, carbs, proteins, powerful antioxidants and soluble fibers. What does that actually mean? It means that it helps reduce blood pressure and the risk of vascular accidents, helps increase the normal growth of tissues, prevents osteoporosis, reduces bad cholesterol, stabilizes glycemia, treats anemia and fatigue. That is a lot, right? Thoroughly wash the beets, place them in a non stick pan, drizzle with olive oil, salt and pepper, maybe some oregano if you feel like it, then bake in preheated oven for about 45-50 minutes or until cooked through. Heat the olive oil in a pan and braise the leek until soft and tender (a few minutes). Set aside. In a food processor chop the nuts, add the basil and cheese and mix until a thick paste forms. Add the beets (don't peel it! ), egg, leek (oil included), salt and pepper and mix some more. You don't want a very fine mixture, leave some lumps in it, it'll add some texture to the burgers. Add the oat flakes and mix with a spatula. Form 8-10 burgers and place them on a silpat/parchment paper in a baking sheet. Bake in preheated oven (200 C) for about 20 minutes; make sure that after 10 minutes you turn them on the other side. Remove from the oven and let them cool on the baking sheet; don't try to remove them, or they might crack. To serve - spread some mustard on the buns, place the burger, then the salad, onion rings, apple slices, mozzarella/ketchup/mayo. I usually make a double portion of these babies and then I freeze them individually, on a plastic tray. The next day, I take them out of the freezer and put them in separate plastic bags, four burgers per portion, then pop them back in the freezer. 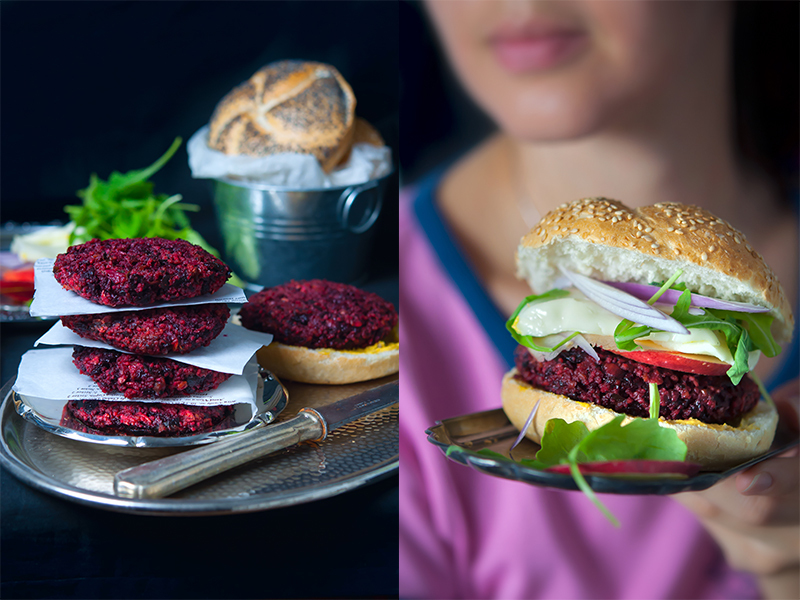 Whenever I want a fast meal, I take a portion out, heat the grill or a pan and simply grill the frozen burgers back into life. In 5 minutes they’re ready to eat – and what a treat they are! 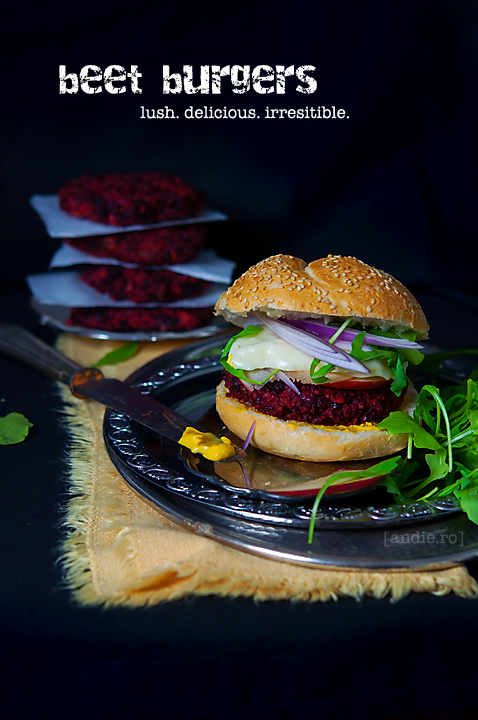 Leave a Comment on Beet burgers. Lush. Delicious. Irresistible.